Von Fractal Basilisk kommt ein Kickstarter für Sci-Fi Regeln. We wanted to strike the right chord between tactical depth of play, narrative campaigns and character development along with a commitment to streamlined rules while maintaining sophistication. Combined with a stunningly alien scifi setting that is vast enough to encompass many themes as a player’s imagination can conjure, it’s a game meant to scratch an itch we’ve felt for ages. 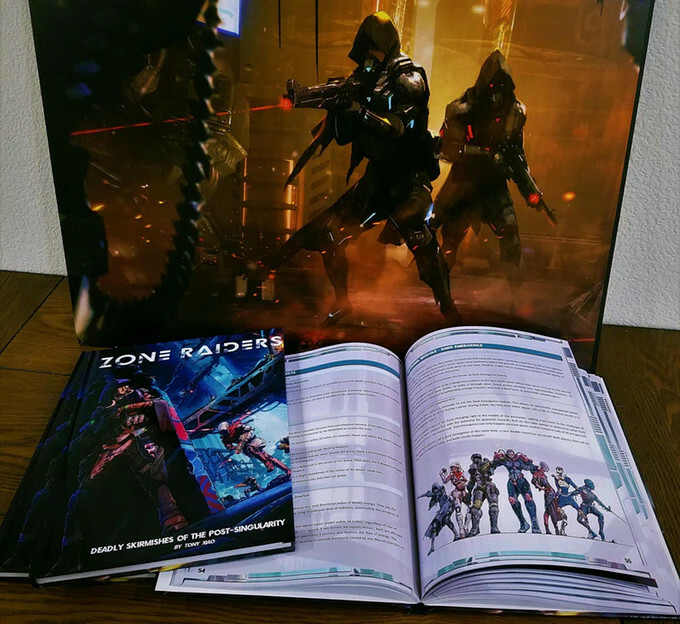 Zone Raiders is a labor of love by a very small group who adore tabletop games headed by indie game designer Tony Xiao. Veterans of the game industry, top artists and model painters have collaborated to try and bring the experience we’ve always wanted to life. 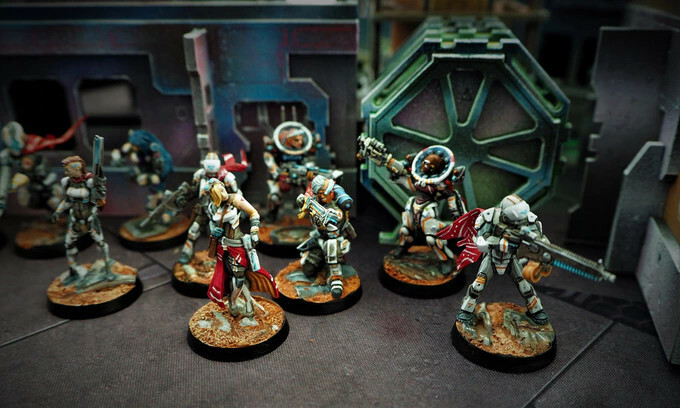 We wanted to explore new scifi offerings in the campaign skirmish genre, as well as to bring in new players with rich cooperative play. Zone Raiders is our way of doing just that. 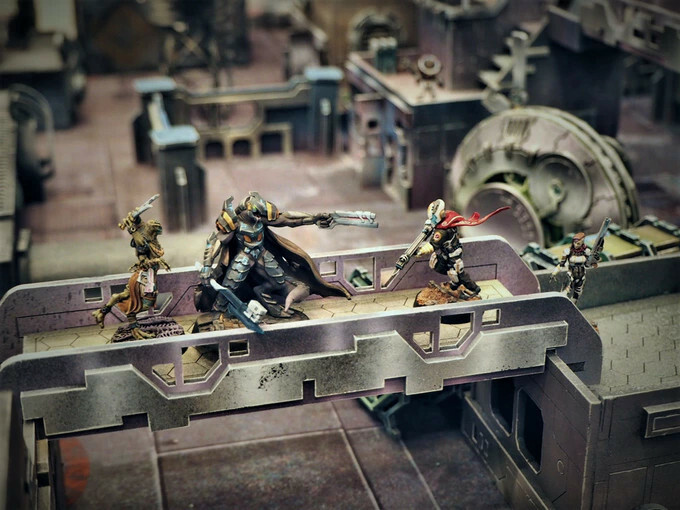 We are an Open-Model game, meaning that the rules and setting are designed for what miniatures you may have and adore. There’s numerous fantastic manufacturers out there, and many of us certainly have collections ourselves. 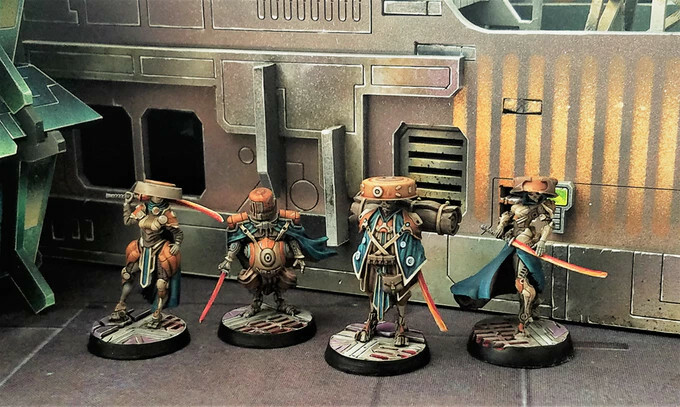 Additionally, creating your own group and their stories is all the easier as inspiration can be drawn from all the beautiful models our greater gaming community has created. 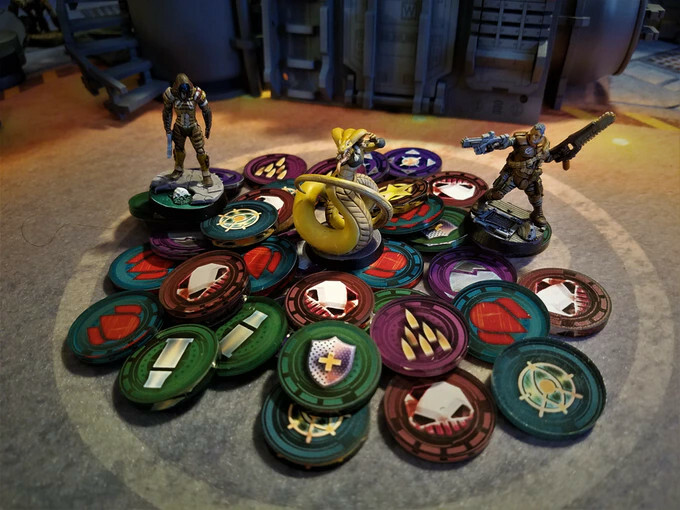 Rich, Easy to Learn Rules – Combine easy to learn core gameplay with mechanics that reward tactical positioning, maneuver, and applied firepower to outfox your opponents. Practical rule design ensures that no decision is without appropriate consequence. Tactical Team Skirmish – Build a Raid Team of 6-12 hardened survivors in your quest to endure. Equip each one with different weapons and specialized skills and watch them grow… or die. Dynamic Movement – Feel the mobility of our unique Dynamic Movement system, where your Raiders can be equipped to parkour, wallrun, grapple or powered vault across broken terrain and lethal gaps. Smash opponents off tall ledges, or create forcefield walls to trap them in place! 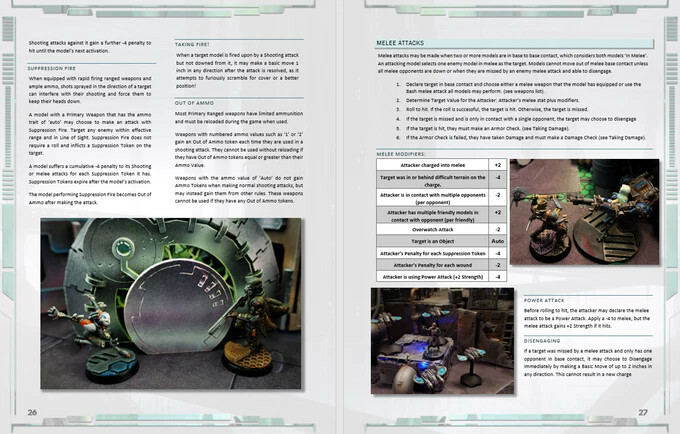 Deadly Environments – Your opponent is not the only threat on the battlefield. 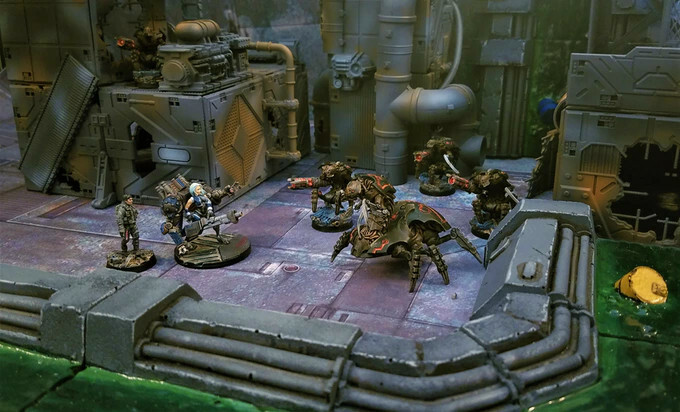 Protecting ancient relics and scavenge are automated exterminator machines, psionic mind-scorchers, fierce nano-contaminant storms and radiation fluxes. When the lights vanish or unexpected snipers arise during a Dark Emergence Event, can your forces adapt? 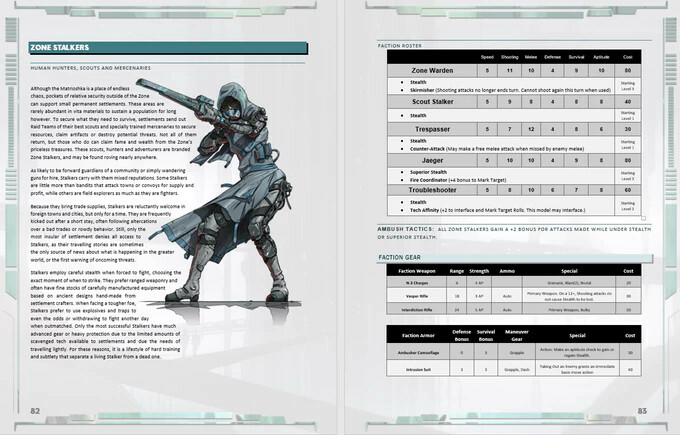 Diverse Factions – Command 7 unique factions with engaging playstyles, from the regimented Reclaimers, the agile Technomads, cunning Zone Stalkers to the evolving robotic NthGen, each force is dripping with flavor and tactical options as well as unique researchable doctrines and equipment. Campaign System – Lead your team beyond a single battle, but to victory in a campaign where your strategic decisions have great importance. 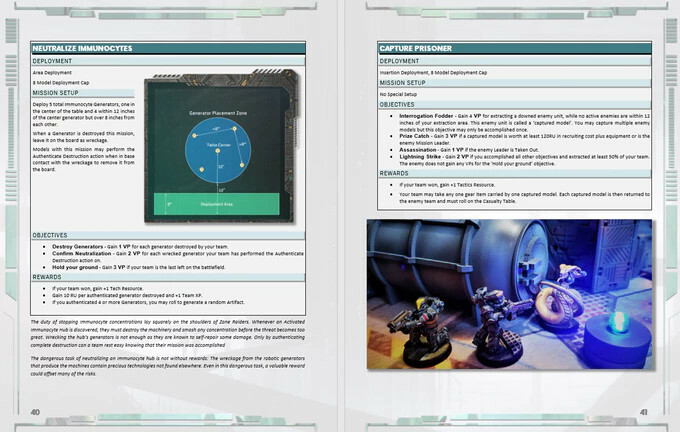 Will you build up your team’s tech skills, or abort the mission to retrieve an ancient cryopod? Should your team construct a mighty industrial robot, or develop maps of the battleground for a tactical edge? Asymmetric Missions – Winning a battle isn’t the same as winning a war. Players can elect different goals during a mission, from capturing prisoners to hacking an automated train. Perhaps it’s worth it to cut your losses during a failed mission, or even change objectives mid game as a new, more valuable prize is discovered! Exotic Equipment – Featuring over 100 different types of weapons, armor and survival gear, you will have numerous options on how to equip and defeat your foes. Merciless AI Enemies – The Immunocytes are merciless machines that are anathema to all intelligent life. Destroy or outmaneuver their AI-controlled agents during battle, or perhaps even trick them to tie up your opponents! Cooperative Play System – Sometimes the enemy of my enemy is my friend. Join forces with other players to take on thrilling Cooperative Missions, where you must employ speed and stealth to defeat overwhelming numbers of AI foes to accomplish cinematic objectives as either single missions or campaign play. We desire to make the best game offering possible, so stretch goals are for upping our experience even more! So for each level of Veteran Raider or greater, we’ll add the following to each pledge after success. 7,500 – Our Campaign Goal! 20,000 – Narrative campaign expansion, featuring complete competitive and co-op campaigns with new fiction! We’re a small studio and will give you our absolute best effort to provide swift and effective shipping. Any supplementary shipping will be collected outside of the pledge cost. The books are hefty and we’ll aim to keep it at around $10 for US/Canada for most pledge levels. We’ll aim to do our best for the rest of the world, but likely it will be in the $15-20 range. Thank you so much for your understanding! Auch kooperative Missionen im Spiel anzubieten finde ich ziemlich cool. Mal im Auge behalten. Frage: von wem stammt der Schlangenmensch aus dem letzten Foto? Zum Spiel: Bild 1 eine Frau die in einem He-Man-ähnlichen (also sehr männlichen) Kampfanzug steckt und quasi aus dem Auschnitt rausguck? Nee … davon ab, erinnern Minis und Marker leicht an Infinity. Wenn man ein bisschen in den KS Kommentaren stöbert haben die das wohl auf dem Las Vegas Open zum Testen aufgestellt und viele Leute haben es als „Infinity light“ empfunden. Das, plus die Möglichkeit auf Koop, Kampagne und KI-Gegner haben mich dazu bewogen einzusteigen. Kann mir einer sagen von welchem System die Dame aus dem zweiten Bild ist auf der linken Seite?